Move over, Oregon and Oregon State. Portland State has joined the NCAA Tournament club -- for the second time and with its first Big Sky title since 2010. 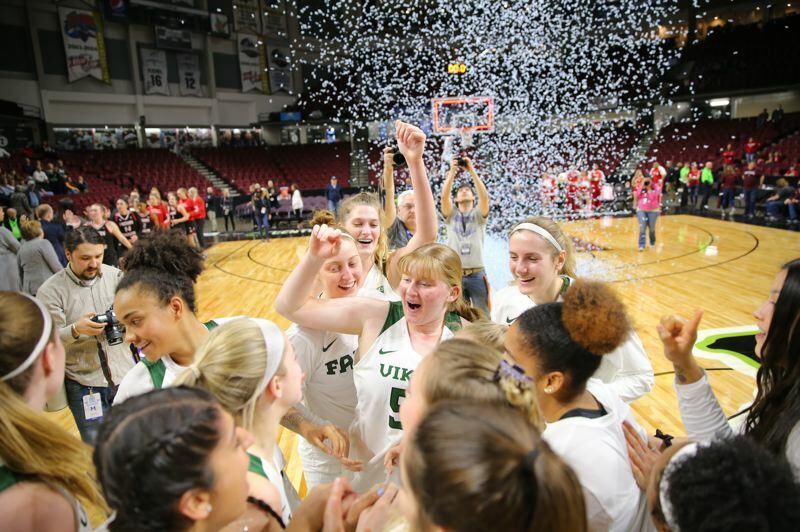 The fourth-seeded Vikings capped their run through the conference tournament with a dramatic 61-59 finals victory over sixth seed Eastern Washington on Friday afternoon at CenturyLink Arena. Desirae Hansen, a 6-0 freshman guard from Rainier High, scored on a jump shot with four seconds left to break a final tie and give PSU the win. PSU will take a 25-7 record and four-game win streak into the NCAA Tournament. Eastern Washington (13-20) led 33-31 at the half and for most of the second half. Portland State fell behind 57-50 on an Eagles 3 with 5:35 remaining. Vikings senior guard Sidney Rielly hit a 3 with 5:10 to go, junior forward Jordan Stotler scored inside with 4:11 left and sophomore guard Kylie Jimenez hit a jumper with 2:28 remaining to pull PSU even at 57-57. After an Eagles turnover, senior guard Ashley Bolston made a jump shot for a 59-57 lead at the 1:50 mark. Eastern Washington tied the score on a layup with 20 seconds to play. Hansen subbed in for Stotler and got the winning basket. Jimenez fouled intentionally with two seconds left, and EWU's Violet Kapri Morrow missed a corner jumper that bounced off the rim at the buzzer. Four Vikings scored in double figures. Bolston had game highs of 16 points, 10 rebounds and five assists and was named the tourney MVP. Senior forward Courtney West had 11 points and seven rebounds. Rielly had 10 points, and Stotler tallied 10 points and had nine rebounds. Jimenez also made the five-play all-tournament team. Hansen was 2 of 6 from the field and had four poiints in 23 minutes as one of only two Portland State reserves to play. Ana Tainta had three points in 17 minutes off the bench. "He (Kennedy) put the ball in my hands, told me what I needed to do and what to look for, and he gave me the trust so I just shot the ball," Hansen said. "Every little kid dreams of hitting a shot like that, and you just shoot it for fun and one day it becomes a reality." PSU had a 32-12 edge in points in the paint. The game was tied nine times, and the lead changed hands 10 times. Eastern Washington led for 29:17; PSU was on top for 6:41. Vikings coach Lynn Kennedy said he felt confident after his team closed the regular season on Saturday with a win at Montana State. "I knew after that Montana State first half last Saturday that were going to win this," Kennedy said. "We were a different team, and we locked it in. Give Eastern Washington credit today. They played a great game. I'm proud of all of our players in what they've done. It shows how special they are and their true character today to come out and be on top." The unsung Eagles had knocked off both No. 3 seed Idaho State 61-59 (the same score as in Friday's PSU game) in an overtime quarterfinal and No. 2 Northern Colorado 59-57 in Wednesday's semifinals, after opening with an 81-74 win over 11th-seeded Weber State. PSU went 2-0 in the regular season against Eastern Washington, with wins by 12 and 19 points. "First, congratulations to Portland State. They played a terrific game and had a great run this tournament," Eastern Washington coach Wendy Schuller said. "I feel like my heart has been ripped out my chest right now, obviously. Our seniors and the rest of this team laid it out there like I've never seen a team lay it out there for four games in a row. I couldn't be prouder to be their coach and honestly, I just feel really bad that I couldn't get them to the NCAA Tournament. They deserved it and worked so hard for it, and I feel bad I couldn't get them there."